Have you ever wondered the secret behind chimpanzee habituation experience? It is much more than being with the chimpanzees. Most people have mistakenly thought of chimpanzee trekking and habituation to be similar,habituation entails spending the whole day interacting with chimpanzees contrary to an hour spent in trekking. Abbreviated as CHEX, chimpanzee habituation experience is done in the kibale forest national park and is a unique experience that cannot be got elsewhere in the whole of Africa. 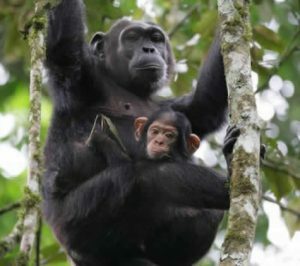 A chimpanzee habituation permit at a cost of 220usd is an obligation for everyone taking part in the experience and can be accessed from the Uganda wildlife authority (UWA). Once a traveler gets a permit, he or she is assured of being with the chimpanzees the whole day hence in-depth knowledge about the chimpanzees. Travelers are required to be at the starting point early in the dawn to start up the hiking. 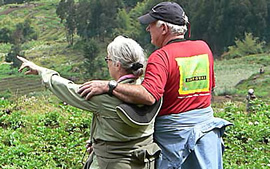 Experienced armed guides hired by the Uganda wildlife authority lead travelers through the jungle in search for the chimpanzees. Trekkers together with the guides follow tracks in the forest depending on where the chimpanzees slept the previous night. While searching for the chimpanzees, travelers are blessed to encounter other wildlife in the national park such as elephants, baboons, black and white colubus, red tailed monkeys, duikers, warthogs, buffalos, bush pigs, leopards, African golden cats and mongooses among others. A variety of bird species and butterflies are also seen in the process, which adds to the final experience. About the number of people taking part in the experience, currently twelve people are allowed but the figure does not involve the porters and guides. Since travelers spend the whole day in the jungle, packed lunch is provided. These include simple snacks, eats, fruits and enough drinking waters. Potters help in carrying these hence making it easy for travelers to hike. Timely planning is highly recommended for everyone to take part in the experience. It requires advance booking at least three weeks earlier and the payment of the booking fee. This permits timely planning and allocation of the chimpanzee communities to the travelers on the real day. On that very day, a simple briefing before hiking into the forest is a must attend for every participant. Here travelers are familiarized to the dos and don’ts while with the chimpanzees, to have non-flash cameras and keeping a distance of seven meters away from the chimpanzees. After Chimpanzee habituation in Kibale, where to go for habituation programs? Mountain gorilla habituation in Bwindi impenetrable forest national park is a one-life time experience. Bwindi is the only site were this experience is offered and there are two mountain gorilla families undergoing habituation both in Rushaga sector of the national park. However, a maximum of four people are allowed to take part in habituation experience at a cost of 1500usd quite high compared to the chimpanzees. Golden monkey habituation yet another experience which takes place in the tropical rainforest of Mgahinga gorilla national park. It is a newly introduced tourism product but has become a highlight for tourism there. In the whole of the virunga conservation area, Mgahinga is the only site where golden monkey habituation takes place. Golden monkeys are good-natured animals, which continuously hurdle over travelers in the process of interacting with them making the experience so lively. Reminder: In both experiences, advance booking and paying for the permits is highly emphasized, it is a “first come first serve” aspect but the experience in both is real amazing. Physical capability is a necessity in all experiences since both animals live in tropical rainforest of higher altitudes. In conclusion therefore, Uganda is surely the pearl of Africa whose tourism experience cannot compare with any other country. It offers the best wildlife encounter in the whole world (chimpanzees, mountain gorilla and golden monkeys), which are rarely found in other tourism destinations. Every traveler should therefore visit the country for the unbeaten kind of experience.